A tooth shaped cover that is placed permanently over your tooth is known as a dental crown. Its purpose is to restore your tooth’s size, strength as well as its shape ultimately to improve its overall presentation. The dental crown caps the tooth just above the gum line and is then cemented into place. You may be required to make multiple visits to your Burlington dental office to install a crown. Preparation is required before the crown can be implanted. The tooth will be shaped and grinded down so that the crown can fit on top of it. An impression of the tooth as well as the gums surrounding it will be made and sent to the dental laboratory so that the perfect crown can be created. 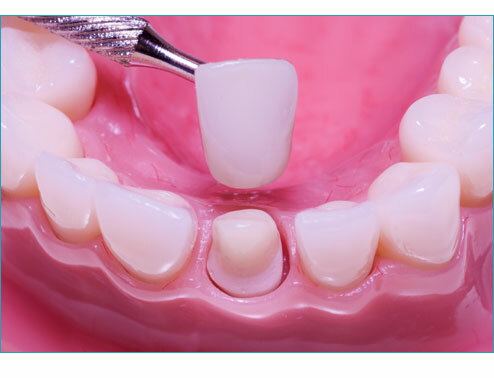 You may have a temporary crown fitted over your tooth until your custom crown is ready. When your crown is ready, your dentist will cement it directly on your tooth. Missing or lost teeth leave visible gaps between your natural teeth. This is displayed more prominently when you have missing teeth in the front. This results in a bad smile and embarrassment. If one or more tooth is missing from your mouth, a dental bridge will be required to replace your natural teeth. During your initial visit, your Burlington dentist will examine your teeth, take x-rays and evaluate the durability of the neighboring teeth as they will provide the support needed for the bridge. The teeth that will be supporting your bridge will be prepared and shaped so that they can effectively hold the bridge in place. When the preparation is completed, the dentist will create impressions of your teeth and send them to the dental lab so your dental bridge can be created. A temporary bridge will be fitted until your bridge is ready. When your bridge is completed, the dentist will place it on the supporting teeth and be cement it securely. Major Intersection: Walkers Line and Upper Middle Rd.